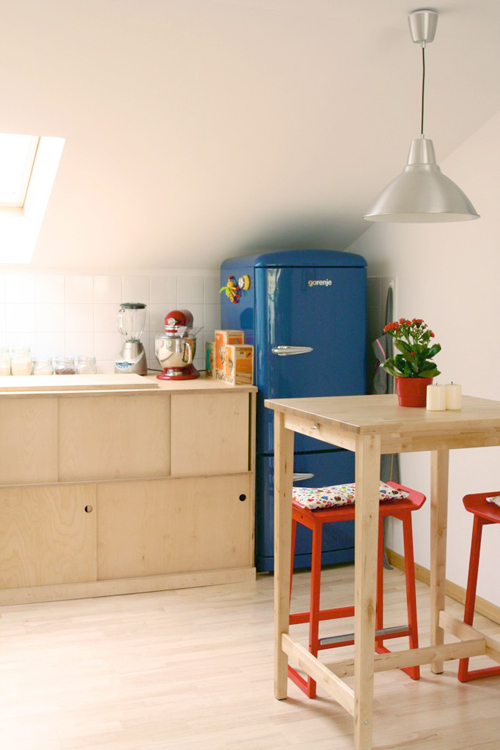 When designing an attic with a kitchen one has to figure out the electric and plumbing needs of the space with professionals. Another issue that has to be addressed is the floor's ability to sustain the weight of a refrigerator and stove. Again, I highly recommend to ask a professional for advise. 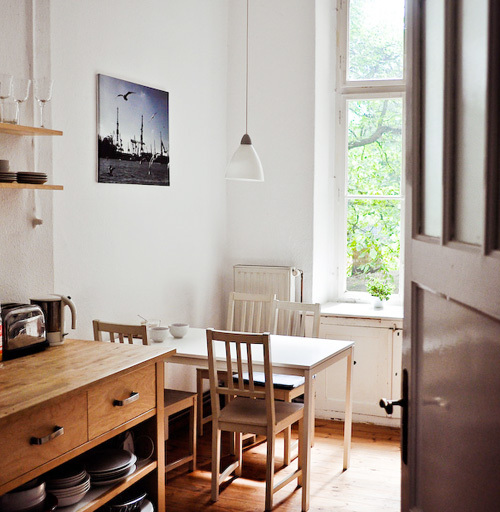 Both pictures below demonstrate examples of kitchens done in white, with a window that lets a lot of light inside. The white color reflects the light coming form the window and set an airy, unpretentious, breezy feeling in both kitchens. 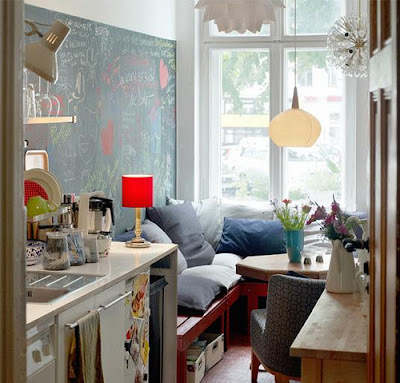 Below is another (fun and cozy) example of seating in the kitchen. 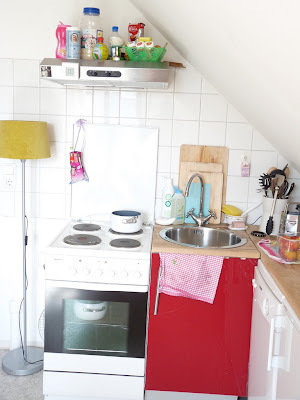 The kitchen in the next picture is set on one wall (saves in electric and water install cost). 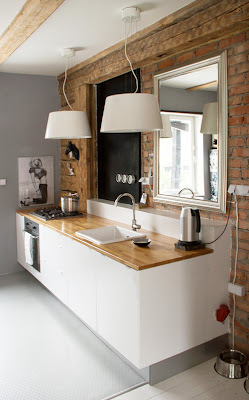 The hood add a industrial element and interest to the room. 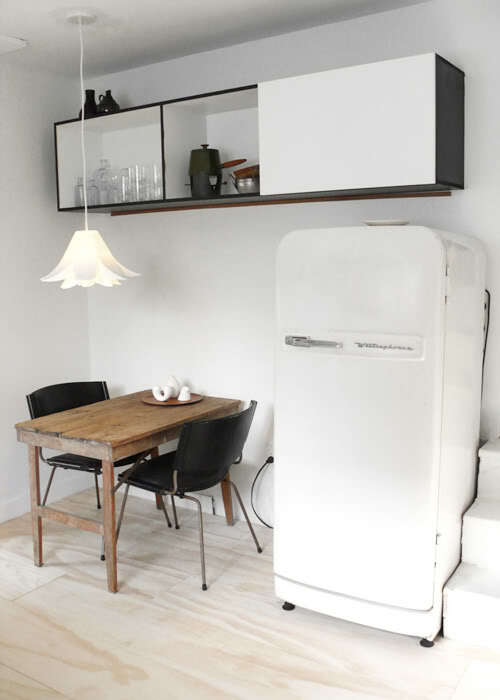 In the picture below the owners used a small corner to set the refrigerator and the dining table in. They also added shelves above. Great use of space. 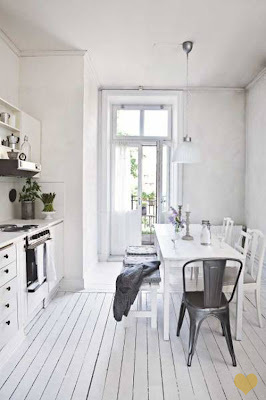 Another white on white airy kitchen. The rooms below are stunning in their simplicity. 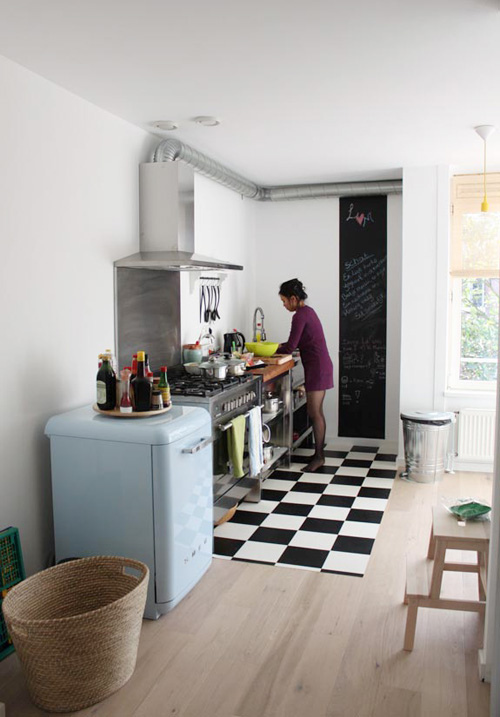 Note how small the kitchen space is, but still accommodating. 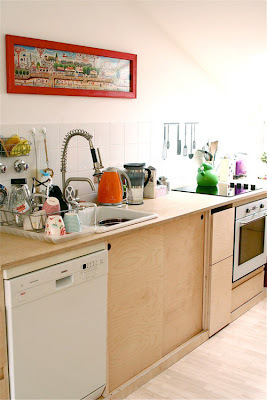 Note the use of very high kitchen cabinet to add more storage space. The white unifies all the rooms into one composed space. The wall paper adds whimsy. I just LOVE this space in the next two pictures. So simple. So cool. The use of primary colors - blue, red and green (the frog cattle) is great. No fear here. Color is the easiest way to go wild - you can always change it. Especially on a small items like the refrigerator or chairs. That's an easy trick to steal. The cabinets are made of cheep plywood. Simplicity. Beauty. 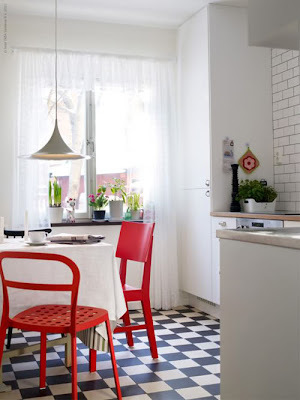 Here is another, simple example of the same principles of using white and primary colors. The picture below shows a kitchen the size of a small bathroom (approx 6" X 6"). 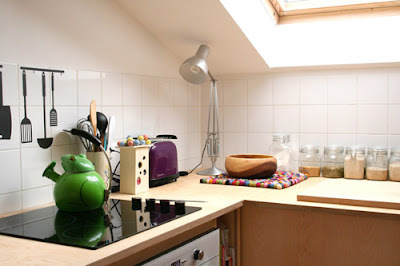 Originally the kitchen had 4 walls and a door. The owners took two walls down (where there's an island and an entrance now). It shows a smart and beautiful use of open and closed shelving and storage. 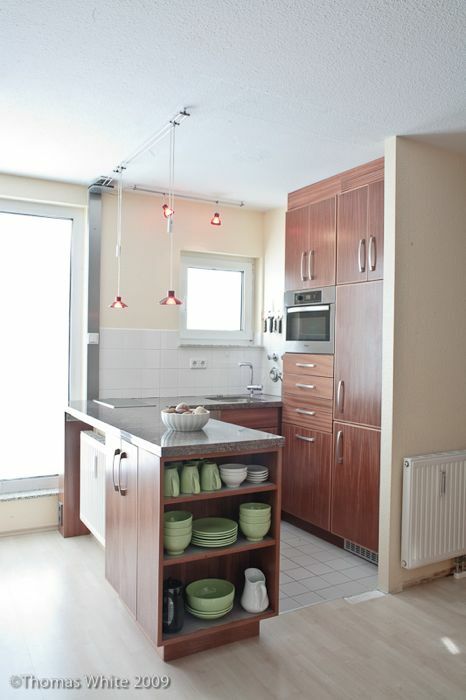 Below is a stunning kitchen. Again, all on one wall. Look what can be done on one 6" wall. The designer used here warm materials - brick and wood, in contrast with cold materials the white cabinets and the stainless still appliances. I totally dig it. 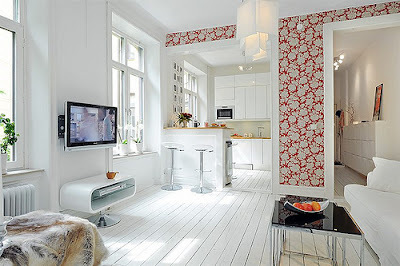 Contrast adds interest to any space and is one of the elements of contemporary design.